I have so enjoyed hooking up to Junker Newbie’s What Would You Do Wednesday link party, but she has been so busy that she hasn’t had time to host the party lately. That is ok. I understand a busy and crazy life. Don’t we all? However, I still have something I want to show…these wonderful stove parts. They are filthy and need some work, but when I saw them, I just knew I had to get them. I am still not sure what I will do with the top part, but the base in this photo, I want to clean up and figure out how to use as a wall hanging. The patina on this thing is so cool. So would you have purchased these stove parts? They’re beautiful! Maybe the finial would work as a book end? Love your treasure cant wait to see what you do with it!!! 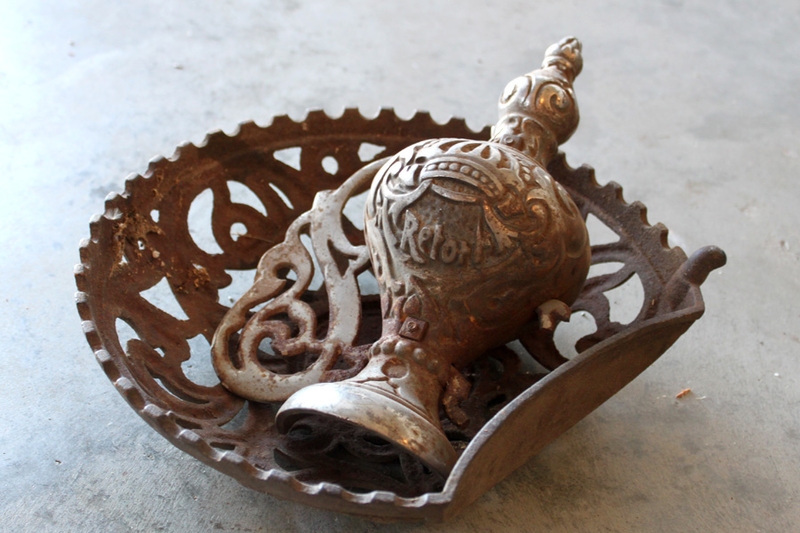 “lid’ that slid back to put wood into the stove – a decoration of sorts – some were very elaborate. look up vintage wood stove-you will find it.